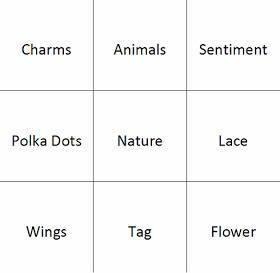 Paper, Pens and Pretty Things : Digi Choosday Challenge – Tic – Tac - Toe! Digi Choosday Challenge – Tic – Tac - Toe! Good morning everybody! How are you? It is Choosday which means it’s time for a new challenge over at DIGI CHOOSDAY and for our theme this time we have a Tic Tac Toe board! So pick any three in a row either vertical, horizontal or diagonal and play along. As always we have a wonderful prize on offer for our lucky winner so check out the BLOG for details. And don’t forget you could also win a Feather in Your Cap! See all the details HERE. And if that wasn’t all it is also DISCOUNT DAY so you need to grab the code to get a MASSIVE reduction in the POLKADOODLES SHOP! It’s a limited offer so be quick!! For my make today I chose the diagonal line….Wings – Nature – Sentiment and I would like to share a very basic tutorial to show how I made this card base. Then go crazy sticking stuff all over it and there you are!! So pop over to THE BLOG where you can join in with our fab challenge. And don’t forget to visit the STORE as it’s…. Oooh that's so pretty. Love everything about it and thanks for the great tutorial as well. I definitely need a scoring board...can you believe I don't have one in my stash??? Oh wowser! This is sooo pretty, and fab tute as well! Fabulous card and stunning detail Jane. Great tutorial! So beautiful!!! Love the colours and the texture from the spider web. Thanks for the tutorial. Hi Jane your make is gorgeous love all those flowers. Wow! Fabulous work! Thank you for sharing your card in our challenge this week at Cupcake Inspirations. Beautiful...love all the flowers and butterflies. Thanks for joining us at Aud Sentiments. I have a Question, there seems like so much dimension, how is this card for folding and mailing? Hi Sue! Depends on how much 'stuff' to stick all over it but it will fold down to fit into a C5 (UK size) envelope. Awesome card ! Love it ! Thanks for playing along at Sasayaki Glitter ! Digi Choosday Challenge –Things With Wings! The Pencil Case - R = Red & Pink! The Pencil Case - Q = Quad (4 of anything)! Digi Choosday Challenge – Anything Goes! Winnie Fruit Punch Facebook Launch Party!